And so, after achieving a wholegrain (whole wheat, oatmeal) bread loaf, which is perfectly edible (my bread machine recipe HERE), my greed for something new set me going on a googling-youtubing craze again for a multigrain, possibly low carb bread recipe. But what came up were mostly just bread made with almond meal, which is extremely expensive and totally not sustainable for my lifestyle. Depending on the brand, you might need to cough up at least almost $18 SGD for a packet of almond meal that doesn't even give you 500g of the almond flour on iherb, and that's way too expensive even in the name of low-carbohydrates. Plus, having a bread loaf made mostly (or entirely, in terms of dry ingredients) from almonds actually means 1 thing. Yes, it's low in carbohydrates, but other than almond flour, you will still need to add in milk, butter (oil) and possibly eggs, which means, this is a low carb, but super high fat bread loaf! And so, while I was lamenting that a truly healthy low-carb bread loaf is not going to be possible, I came across this on iherb. It's not exactly the cheapest flour mix you can get on iherb (it still cost you almost $10 for this pack of 453g) but comparing this to using solely just almond meal? I'll choose this anytime. 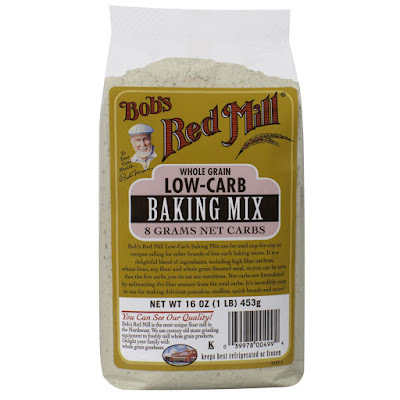 Plus, Bob's also does a low-carb bread mix so it can only get even easier for you if all you want is to make bread with it. The grains that went into this flour mix includes: wholegrain oat flour, oat bran, oat fiber, flaxseed meal, wholegrain rye flour, wheat bran & wholegrain soy flour. These ingredients gives you only 120 calories per serving of 30g, and 13 g carbohydrates with 5g fibre, hence giving you a net carbohydrate of only 8g per serving! Using a mixture of this low carb flour blend and wholemeal flour, I decided to bake a loaf of multigrain fruit bread using my Mayer bread machine! your choice of dried fruits, amount is up to you. Even though I've started using VWG, I'll still prefer to do a quick soak of the wholemeal flour in the milk for at least 30 minutes before I add in the rest of the ingredients (except butter and dried fruits) for mixing using the mix dough function. After which, I restarted the machine on multigrain function and add in butter during mixing. Do keep a close check on the dough during mixing / 1st kneading. Add in more liquid or flour by the teaspoons if your dough is sandy (too dry) or mushy (too wet). Dried fruits will be added in after the feeding point beep sounded on the machine. If your bread machine somehow do not have such a function, or you're making this by hand, add in the dried fruits during kneading after 1st proofing (before shaping & 2nd proofing). 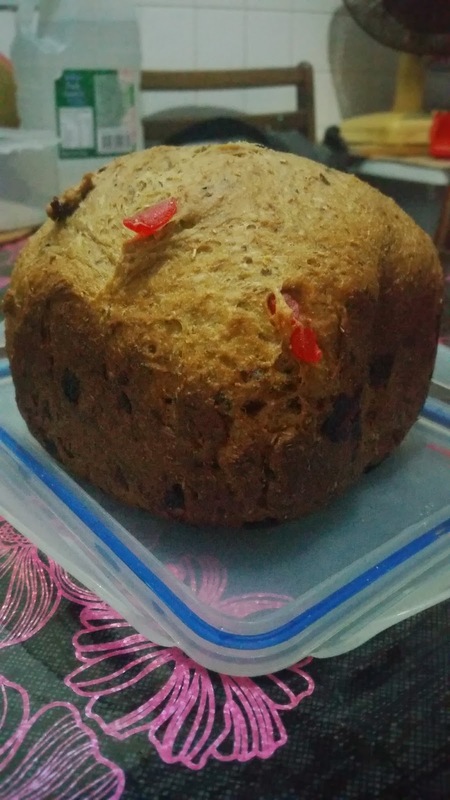 Tadaa~ Here's my low-carb multigrain fruit loaf, which an acquaintance thought was panettone. Have you ever tried baking your own low-carb bread using a blend of flours that's lower in carbohydrates too? 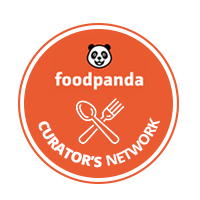 Do share your recipes with me in the comment board below! To get the low-carb flour I've used for this recipe, hop over to iHerb right now! Awesome recipe. This is perfect for the health buff who also doesn't want to starve. The fact that it's multigrain also makes it more fibrous. Someday when I learn to cook and bake, I might have to try this! Wow, this one is interesting! Aside from it is healthy and low carbs, this multigrain fruit loaf is something I should learn to make. Thank you for sharing your recipe. I havent heard of this mix before, but it sounds interesting and definitely something my mum would like to use. It is good to see a low carb loaf to. Wow and how huge did it turn out, enjoy! This sounds great and looks amazing. It's huge! Looks good, but because of time constraints, maybe I would just buy a loaf instead. But this way, you are rewarded with self-satisfaction of baking it yourself. This loaf would really be good for the tummy. It's low carb and high in fiber. Do you eat the bread as it is or do you apply butter or jam with the bread? Although the mix is not cheap, for health, this should be quite worth it! Good to know that you found a low carb whole grain. Ingredients like this would normally cost more but it's definitely worth it! Looks like a healthy recipe. Would love to see a pic of it cut, so I can see of its fluffy or dense inside. I would definitely give it a try. I love that it's multigrain. That looks tasty and healthy! Bob's Red Mill is a familiar brand here, I know they sell a lot of organic grain products. Good alternative for the expensive almond flour!